ILL finished another blitz for reciprocal contracts with other libraries. So far they have 56 new contracts, bringing contracted libraries up to 113. We now have 56 more libraries we can borrow from for free. Congratulations and thanks, ILL! The vacant full time position in ILL is now posted on the ISU hiring site. 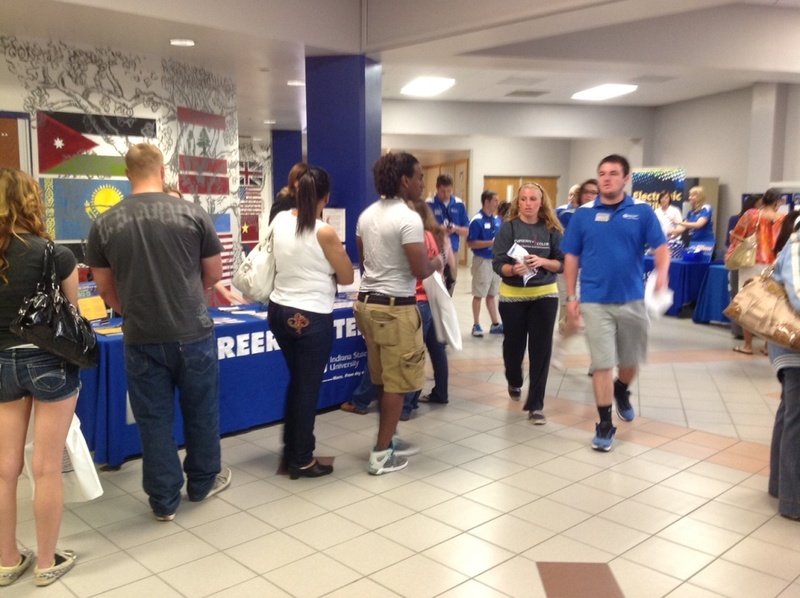 To view the complete job description on the library’s webpage, go to: http://library.indstate.edu/about/jobs/jobs/ . To apply, go to https://jobs.indstate.edu/ . This position is open to all applicants. The fairly brief but fierce wind and rain storm around 5:15 August 16 did a lot of tree damage on campus. 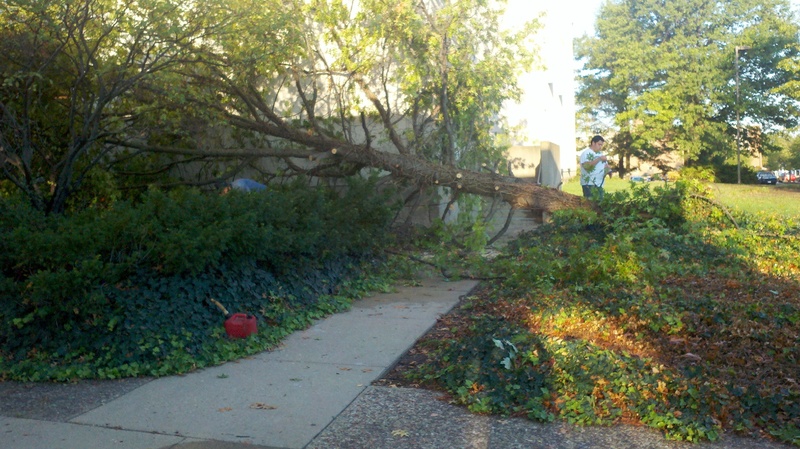 This tree was located near the northeast corner of the front of the Library. 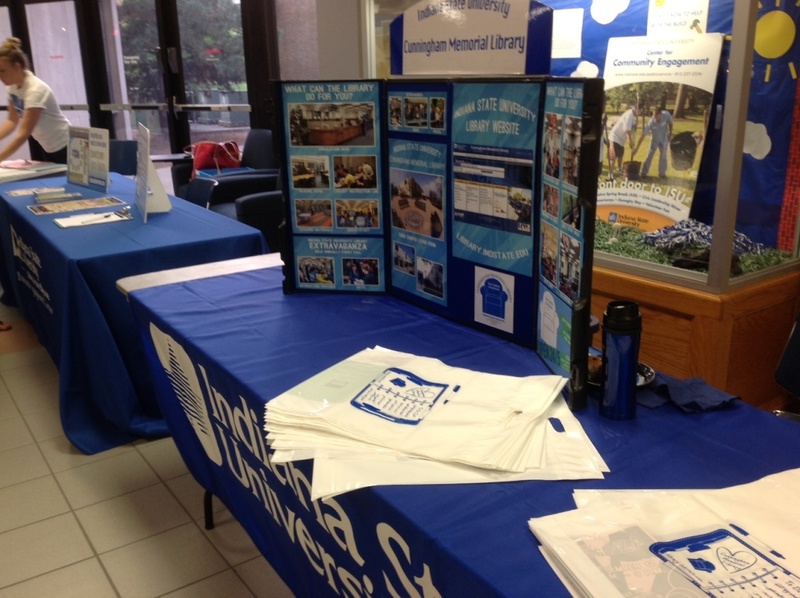 One final New Student Orientation/Admissions Day finds the Library Resource Table in the corridor of HMSU near Dede II. 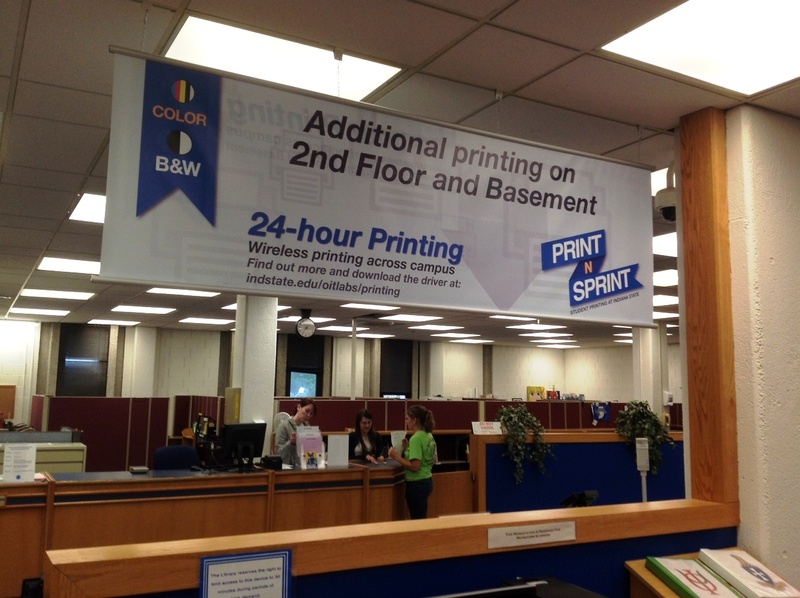 As you can see from the BIG new banner, printing in the Library, as on campus, has changed. No more logging in. When you’re ready to print, just hit Print. Enter your Username in the box that appears. Go to ANY PRINTER. Swipe your student ID or enter your student ID number on the keypad and voila! 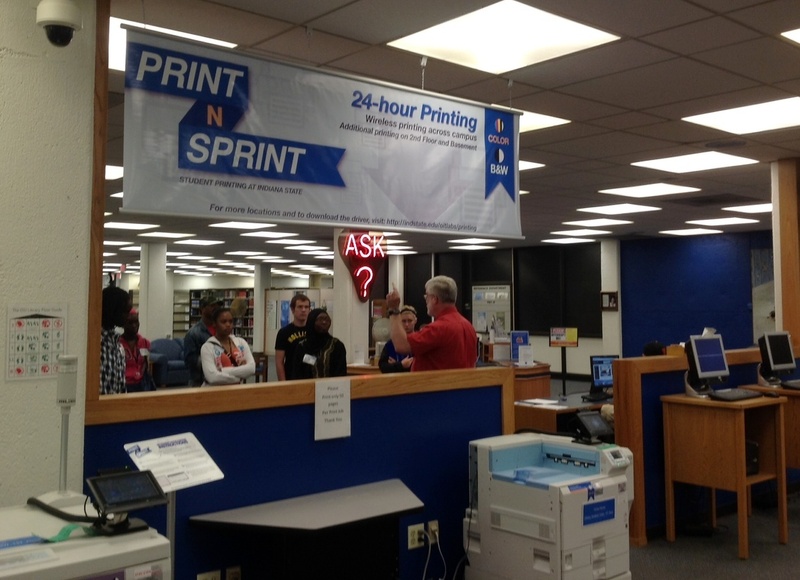 Out will come your printouts. Dr. Miroslawa Podhajecka will complete a one week Cordell Research Fellowship the week of August 20, 2012. Dr. Podajecka is making extensive use of the Ambrogio Calepino dictionaries, which were published for more than 200 years, to chart the development of the Polish dictionary and to trace vocabulary changes. Cinda May, Chair of Special Collections, has been selected as a representative from the State of Indiana to take part in the Digital Preservation Outreach and Education Train-the-Trainer Workshop, Midwest Region, sponsored by the Library of Congress. The applicant pool for this opportunity was a highly competitive one, but Cinda’s skills and experience made her an optimal candidate to become a DPOE Trainer and join the National Trainer Network.